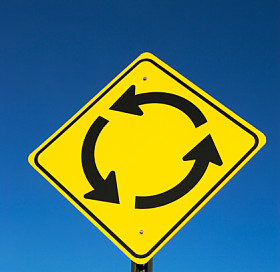 Why do we keep traveling in circles? Maybe I care too much about our industry or am just frustrated by the lack of attention to quality claims handling, but this is annoying. Why should claims make up half of the most frequent market conduct issues for the Property & Casualty industry as listed by Wolters Kluwer for the 5th straight year? As part of their review they track and analyze the results from state market conduct examinations. As with their prior studies, claims issues continue to dominate the list of state concerns. I went back over the last 5 years of this study and the same issues keep coming up. Figure 1 charts all the issues and how many times they showed up on the study. These findings can be prevented with some focus on identifying issues and working to correct the problems. It’s time to raise the game! Why are the same things coming up as issues year after year? We are now in an era of useful technology that should give companies an advanced look into their operations. Through oversight and a quality review program, claims departments are truly in the best position to prevent many of the issues raised on the top ten list. So whys has nothing changed? I am sure every company is different and there are a lot of reason, but I feel there has been less and less attention to internal claim reviews and audits. When times are tight operations are thinned and doing an internal claim review is considered a luxury. Claim departments need to get back to preventing issues before they occur as the consequences for not doing it will result in increased claim costs. Create standards: I know people are reluctant to create claim manuals for a variety of reasons, but there have to be some best practices in place that can be measured. Best practice documents can be drafted appropriately to minimize the risks of them being take out of context in a law suit. (Also if you are concerned, see our prior post of 7 Consideration When Drafting Claims Guidelines). Setting the standards and having staff work to those standards is a good starting place to ensure consistent results. Audit for compliance: You can’t just sit there and expect everything will be fine you must review the work and ensure compliance. Audits are sometimes looked at with disdain, but when managed correctly they are a wonderful tool for training and improving the operation. Don’t just audit the old way, but instead collect data with a tool like The Audit Portal and understand where the breakdowns are (see Claim Reviews Empower Better Decisions By Putting Critical Information In Hand). From there you can truly assess how to correct the problem. Fix and track problems: Getting all the information collected nice and neatly is a good start but now you have to improve on what was learned. Gather the information and look for trends and attack the problems. Is there a systemic problem or was it isolated? Can it be fixed with training or is there a technology solution that needs to be addressed? Analyze the issue and then develop a game plan for correcting the problem. Then – re-audit. As a claims community we can do better. Let’s start a quality campaign to get claims issues off this list! Send this along to others in the industry and let’s start a trend. Tagged with Best Practices, Claims Operations, Cost Savings, Lessons Learned, Quality, Strategic Planning. 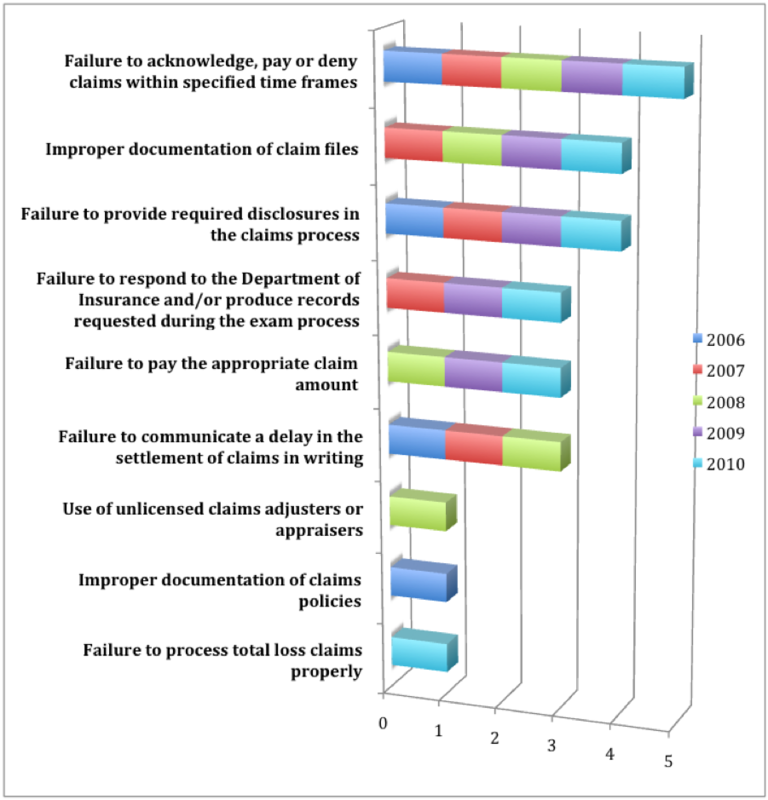 Failure to properly acknowledge, investigate, pay or deny claims within specified time frames, to provide required disclosures in the claims process , improper documentation of claim files, not processing total loss claims properly or paying the appropriate claim amount . Do we disagree the root cause of these issues is directly related to carriers utilizing an inadequate number of experienced adjusters to handle their claims volume? Properly handled claims generate very few DOI complaints and a properly worked, well documented claim file is a solid defense in a DOI investigation. Experienced adjusters understand producing a well worked and documented claim file is the appropriate response to a DOI investigation. Sounds like a management decision to delay responding to DOI most like related to the down side result of cutting costs while producing low quality, poorly worked and minimally documented claims files. Experienced adjusters cause less grief with the public (the source of complaints to DOI) by quickly and accurately adjusting and paying losses. The good will created by said professionals is an invaluable form of advertising which is good for all, including the shareholders. Being an adjuster for years prior to opening Ladder Assist Team LLC I can relate to some of these issues still happening today. I have a theory about some of the issues; (1) Bottom line for all carriers is saving money. Decisions about how o do this are most often made by someone behind a desk who has never been in the field, nor spoken with the adjusters to try and come up with a solution. (2) Over the years there seems to be more and more poured on the adjuster to handle and time frames are hard to meet, which creates a large turnover. Being a company owner myself I can say the work ethics of many today do not amount to much. People are hungry for work but take no pride in what they do anymore. Yes, part of this comes from the feeling of no job security from companies as well as a society that has become narcissistic. A carrier needs knowledgeable employees to do the job correctly and to care! (3) As far as investigating a loss; many carriers have implemented pitch limits on roof access for staff adjusters. Many IA’s wont walk very steep roofs either. This causes issues as a proper inspection is never performed on the roof. Carriers are hesitant to pay out for roof inspections as it effects the bottom dollar. What is failed to be seen in this is: If a reputable & trained inspector looks at the roof there is little need for a supplement and as long as they are not associated with the carrier or a roofing contractor, their assessment is not bias and this cuts down on appraisals and supplements. (4) I wonder in the area of paying the appropriate amount how this area is tracked. There are so many variables here; could simply be a case of hidden damages where a supplement needs to be filed after hiring a contractor. An adjuster can only write what can be seen at the time of inspection. (5) The use of IAs for adjusting also can be an issue. Years ago these IAs were used quite often where now they are used as little as possible due to cost and many who come into the field are new and have very little training. All said; I do believe carriers higher ups need to spend some time in the field doing the adjusters job to gain a real understanding before implementing changes that look good on paper. Carriers need to hear the adjusters needs as they are the ones in front of the Policy Holder and the face of the carrier. Love the topic but from my vantage point it comes down to dollars. Claim departments are loath to hire more adjusters (they write checks after all) and the reigns on expense dollars are very, very tight. Example: Damage claim for a bridge is $102,000 and adjuster explained the lack of investigation (no photos) as his being not permitted to “spend the money.” Another and one of my favorites; truck is rear ended on an interstate but no investigation (no pictures again-I love pictures!) the claim develops to where there settlement is north of $500,000. However, lest you think the rear end impact was significant the Adjuster, in their summary, confirmed that the Police Report (at least we had that) confirmed that there was no impact to the rear of the truck. And oh yea, we overlooked that the driver of the truck was represented immediately and had a prison record. The focus on the ALAE and ULAE is feeding right into the hands of two groups; doctors and plaintiff lawyers. OK, now I am off my soapbox. These are the biggest issues that face Carriers today. Companies don’t care. That is proven every day. Companies only look at ways to improve their bottom lines. They could care less how to achieve it. They figure just add technologh and the adjuster can go faster and be more accurate. But that technology can actually slow down the adjuster thanks to disorganized IT creation. Like the old saying, “If it sounds too good to be true, then it probably is”. Example: If we install a “computer” in our vehicles, then we will get faster and more accurate info! Also in combination, we will reduce the shifting gears in order to lessen the vehicle’s weight thus producing better gas mileage thus making more profit… Problem is, you tell the adjuster they can now get to MORE claims FASTER, be more productive and give better Customer Service, Right? Oh, and if you don’t, you will be written up and your job may be terminated in 90 days if you can not accomplish a number of stops in a day. THEN, you tell your adjusters, Oh BTW, we installed a little black box in your cars so if if you speed, your fired! Now go out and make us more money! So later, Mgmt finds they are not acheiving their goals like THEY were told to do. NO one bothers to figure out that that adjuster has been “Overloaded” with claims and unrealistic demands. Nor that their vehicles do NOT do well with only a First Gear in addition to the overloading. Consequently, the motor burns out and the vehicle stops. This results in not making all his/her claim expectations. So the company’s answer is, Fire the incompetent adjuster and hire one of those Cheaper 3 day adjusters from one of those 3 day Adjuster Schools…. Give me a break! And that brilliant idea about hiring one adjuster to run the territory of 2 – 4 other adjusters in less time and being more efficient! Who hires these managers? And the poor HR people are blamed for not finding and hiring “super employees”! Once hired, many mgrs are too busy to devote actual training time and maybe give 30 minutes a week to the new hires. The remainder of the time, the new hires are told to go sit at a desk and just browse the company website! And 2 weeks later, those in a training class are told to go sit at a desk and answer complaint call for 5 weeks from angry insureds whose claims are not being handles and are months old. Again, you guessed it, it’s the Adjuster’s fault! And some of these company IT systems I have seen where you have to maneuver thru countless screens filled with unrelated data to find one entry window. And for each different entry! Such IT disorganization slows production down tremendously. And the adjuster gets the blame. It’s not that adjusters want to not produce quality claims, they just don’t have the time, get burned out from being forced to work late evenings and weekends with no OT pay and have no social relaxation time. And it all falls in line with the Big 6 above….. But do you think that if those at the top ever came and rode with field adjusters would make any difference? NOT…… Not when more profit is to be had by less employees with faster claim’s service…..
We have a “nature of the beast” situation. Under funding, high case loads, expense management. All these mean claims people work swimming upstream to try and make evaluation and resolution based on too little information, too little time, and lately, too little training. Add the fact that by nature, those dealing with claims departments are not happy to start with because they have suffered a loss. Technology brings improvements in productivity but is almost always immediately negated by increased demands for higher production because of that same productivity. Until the compensation and work load mentalities toward claims changes, those surveys will always shpw the same. Over the course of a year, a good adjuster can save many times his salary. This is mostly important to an insurer, as a TPA does not pay for a loss out of its’ own pocket. If a company cares about quality, the company must care about training, experience, proper workload, and job stability. I agree 100% with most, if not all, of the above comments. Reasonable caseloads would ensure that the adjuster is spending the requisite time to investigate, manage, and settle or deny that claim. A good adjuster will save a company hundreds of thousands of dollars, if not millions, every year (depending on line of business and rank), yet, when it comes to performance review time, he or she is “rewarded” with a 2-3% raise. Makes you wonder how hard that adjuster is going to work to save the company money while negotiating the next settlement.